About this time last year, a tiny coffee shop in my neighborhood hung a “for rent” sign in its front window. It sent me into a weeks-long fantasy about starting a new life as coffee shop owner. I’d trade in all my grubby jeans for cute vintage dresses and adorable aprons. I’d ride my bike to the shop at the crack of dawn and bake simple, homey cakes no one would be able to resist. I’d work hard, but find immense pleasure in the little things: the aroma of freshly brewed coffee, the first morning sunlight, and the satisfaction of being my own boss. Of course, you know, this never happened. 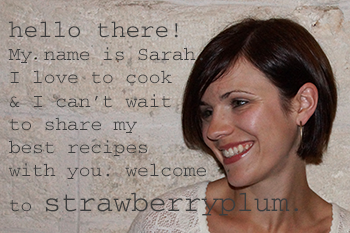 I kept the grubby jeans, never started wearing cute aprons, continued to serve in someone else’s restaurant, and started a blog instead. But, don’t feel bad about my unrealized dream…I kept the best part of the plan intact:I kept on making the simple, homey baked goods. And this way, I get to be the one eating the majority of them. Talk about taking pleasure in the little things! 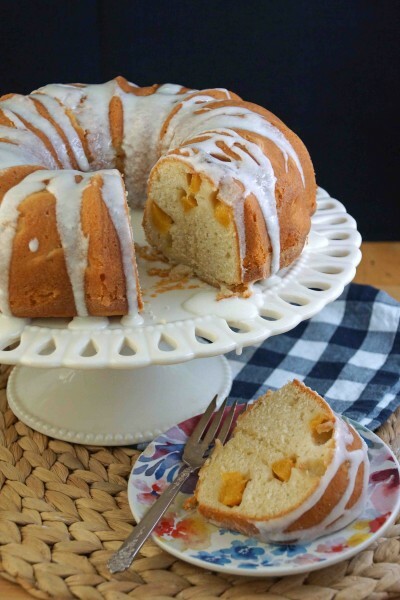 Here’s a particularly example: a peach sour cream bundt cake. I could have centered my entire make-believe shop’s business plan around this beautiful bundt. 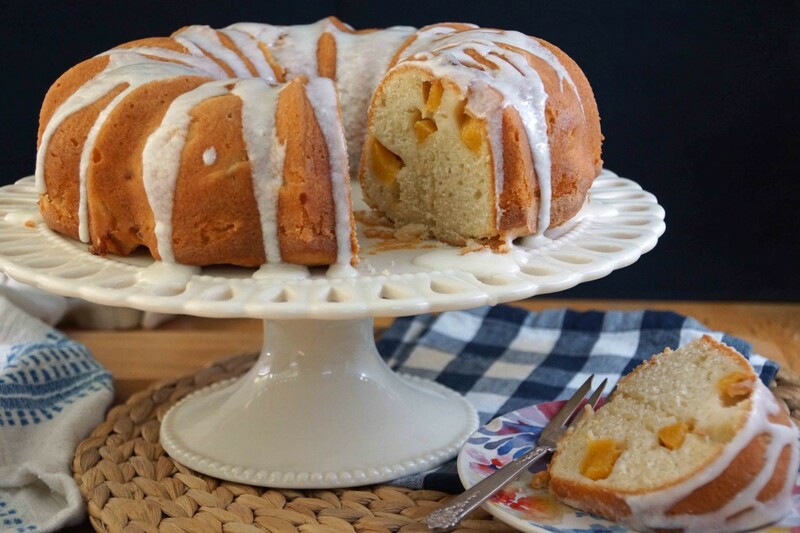 It’s a great anytime-of-day late summer treat, loaded with ripe peaches and spiced up with ginger and cardamom, finished with a drizzle of lemony glaze. Cake time…and it only has to happen at the crack of dawn if you want it too! 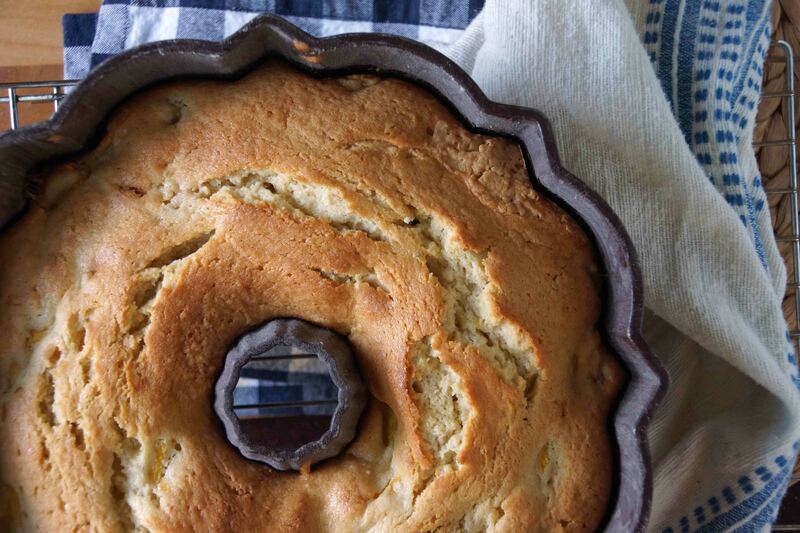 Butter and flour your bundt pan and gather up all the cake necessities. 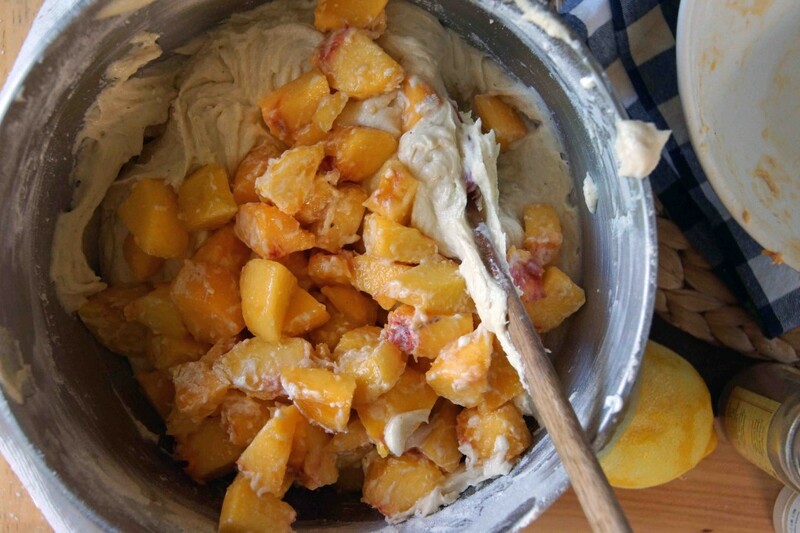 We’re going to use sour cream as our moistener, peaches, cardamom, and ginger as our flavorers. Combine your dry ingredients in one bowl, butter, sugar, and lemon zest in another, diced peaches tossed with a bit of flour in a third. Cream the butter and sugar until light and fluffy, then beat in a few eggs and a splash of vanilla. Stir in the dry ingredients in three additions, alternating with doses of sour cream. Voilà…cake batter. Gently fold the peaches into the batter. Dollop gobs of batter into the prepared pan, even it out with a rubber spatula, and pop it into the oven. The toughest thing about making a cake is not mixing the batter, it’s waiting for it to cool. But we’ve got to stay strong, resist its gorgeous golden crackled top and its intense spicy, buttery aroma, or our glaze will just roll off the sides into an unsightly puddle of goo. Let it cool slightly in the pan, then invert onto a plate or cake stand. Did you remember to butter and flour every nook and cranny? I hope so, because you’re about to find out. After you’ve turned the cake out of the pan, let it cool completely. 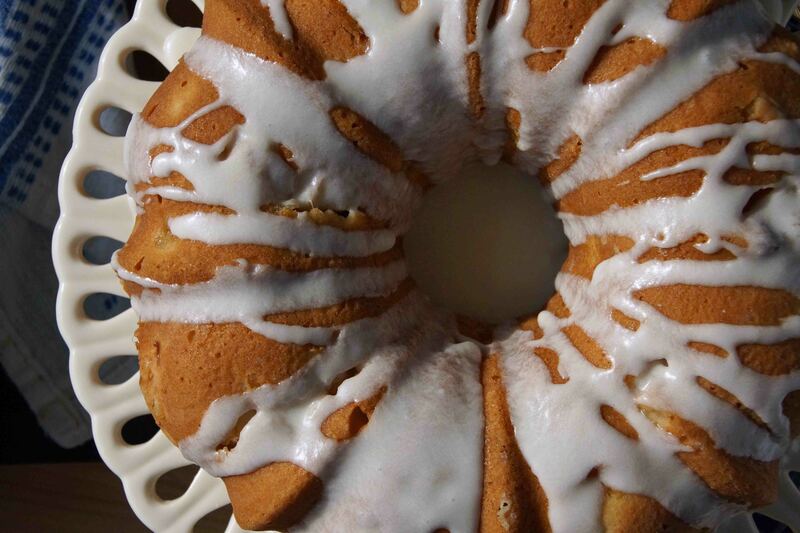 Whisk up a glaze with a pat of butter, powdered sugar, and lemon juice and drizzle over the top of the bundt. Brew a pot of coffee and cut yourself a piece that borders on too big. This beats rising before dawn and it beats dealing with pesky customers first thing in the morning. Some dreams are best left unrealized. 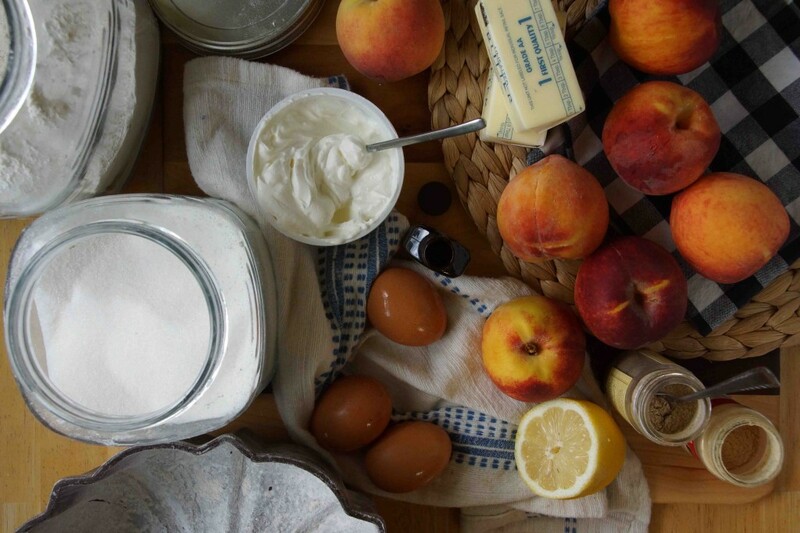 Others, namely baking a glorious peach bundt cake for no particular reason, are best realized as soon as possible. Go! Bake! This cake is just as welcome for dessert as it is with your morning coffee. It stays unbelievably moist for days and the spice flavors actually intensify after a day or 2. Preheat oven to 350°. Thoroughly butter a bundt pan and dust with flour. In a medium bowl, whisk together 2½ c. flour, baking powder, baking soda, salt, ginger, and cardamom. Set aside. In the bowl of an electric mixer, cream together butter, sugar, and lemon zest until light and fluffy, about 3 minutes on high speed. Turn mixer to low and add the eggs, one at a time. Scrape down the sides and bottom of the bowl between additions. Add vanilla, beat briefly. In a second medium bowl, toss the peaches with remaining 2 Tbsp. flour. Set aside. Add about ⅓ of the dry ingredients to the creamed butter, followed by ½ of the sour cream, then another ⅓ of dry, remaining sour cream, and remaining dry ingredients. Mix after each addition until just incorporated and scrape down the sides a few times through the process. 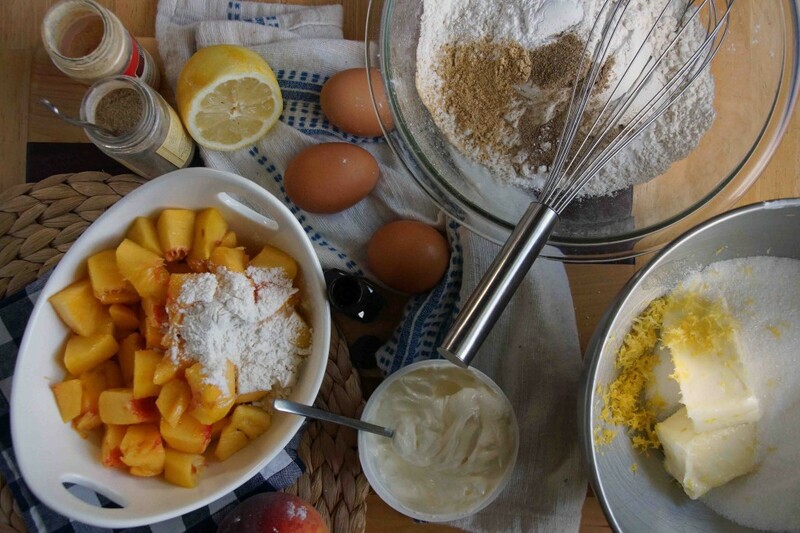 Using a rubber spatula, gently fold the flour-coated peaches into the batter. Spoon the batter (yes, it should be very, very thick!) into the prepared pan and gently spread and even. Bake for about 1 hour to 1 hour 5 minutes, until a tester inserted in the center comes out clean. I had a mild panic attack when I checked in at 55 minutes and the cake still looked soupy (and I was 15 minutes from needing to leave the house--not a smart way to bake, but it did, miraculously work out), but 10 minutes later, the cake firmed up and the tester came out clean. Cool the cake in the pan on a wire rack for 30 minutes or until you can handle the pan without burning yourself. Invert the cake onto a plate or cake stand and allow to cool completely. For the glaze, whisk together the butter, lemon juice, and powdered sugar until smooth. It should be thick and smooth, but still drizzlable (that's a word, right?). Adjust as needed with more lemon juice to thin, more powdered sugar to thicken. Using the whisk, drizzle the glaze over the cake, letting it drip down the sides. Serve now or make it a day or 2 before you need it--it keeps very well. Yum…I think I’ll also be trying it with apples, come fall. Made it! Love it! This is day 2 and you’re right – flavor is even better! Better go stop your dad from having more or there won’t be a day 3!